F&W’s Kristin Donnelly actually looks forward to opening a not-so-stellar wine once in a while, just so she can cook with it. Here, her best recipes. “Never cook with a wine that you wouldn’t drink.” It’s a mantra that I learned in my very first cooking class. But after years of braising, stewing and marinating with wine, I don’t think it’s quite right. I suspect the rule arose because in America’s culinary dark ages, which I also call BJC (Before Julia Child), people used the salty, terrible-tasting supermarket plonk known as “cooking wine.” Nothing short of an abomination, cooking wine most likely ruined many a coq au vin. But now that accomplished home cooks know enough to steer clear of the supermarket stuff, I think it’s time to reevaluate the rule. Yes, it’s true that a wine you add to your food should not be undrinkable—you would never, for instance, want to cook with a corked wine (a wine tainted with a naturally occurring chemical that can make it smell and taste like damp newspaper). But what happens if you open a bottle that’s merely disappointing? I say, if you don’t like the wine, don’t drink it. But there’s no reason you can’t use this less-than-stellar wine to make a fantastic dinner. Heating a wine destroys its nuance, wiping out its complex aromas and flavors and transforming them into a general “winey” taste. I’ve found that whether I’m using a great wine or a mediocre one, the difference in the taste of the final dish is negligible. Sure, a wine with residual sugar, like an off-dry Riesling, will make a dish a bit sweeter, and one that’s overly tannic, like a young Barolo, will make a recipe ever-so-slightly more astringent, but in general, cooking is the great wine equalizer. Recently, I’ve been on a mission to give new life to wines that I haven’t liked enough to drink. I wanted to use up the better part of a bottle whenever possible—minus the glass or two I initially poured. The obvious solution would be to add brandy, fruit and simple syrup to make a great sangria, or reduce the wine with sugar to make a syrupy topping for ice cream. But I wanted to create more substantial dishes that would transform the wine. I started with wine-poached fish. That idea is nothing new, but after cooking salmon gently in a thyme-infused white, I used up even more of the wine by swirling it with butter for a cheater version of beurre blanc that’s delicious with the fatty fish. I also added a bit of wine to brighten the quick summer-vegetable stew of shredded zucchini, fresh corn kernels and ribbons of basil that I served alongside. On the terrific blog Serious Eats (seriouseats.com), Gina DePalma, the executive pastry chef at New York City’s Babbo restaurant, recently wrote about an ingenious way to use up lots of extra red wine: Boil pasta in it. 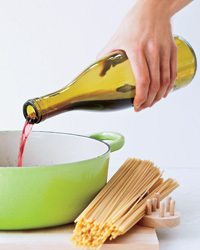 I tried it immediately and couldn’t believe how wonderfully savory spaghetti became when cooked in red wine cut with water. To emphasize the wine-cooked pasta’s earthy flavor (and punch up its antioxidant levels even more), I tossed the brick-colored noodles with parsley and toasted walnuts. Lamb is usually paired with red wine, and rightly so—the tannins in reds are great with rich meat. But I find that lamb’s slight gaminess can be terrific with ingredients typically used to flavor fish, so I tried marinating chops in white wine scented with fennel and lemon zest. After cooking the chops, I reduced the zingy marinade and blended it with a little crème fraîche for a lightly creamy sauce. I was so pleased with the lamb chops, and the other recipes here, that I’ve started hoping for the occasional mediocre bottle of wine, just so I can make these dishes.